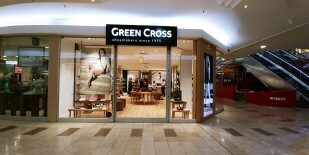 At Green Cross we do more than just craft, manufacture and distribute great shoes; shoe care and foot care products. Since 1975, we have been striving to understand the shape, design and functioning of feet, both at work and at play. Made of genuine leather, soft, supple and breathable materials, our products are lightweight with flexing properties and arch-support technology. Striking the ideal balance between science and fashion, we do not compromise on quality and comfort and strive to ensure our shoes look as stylish as they fit and feel. Ensuring your feet can move as nature intended, Green Cross is perfect for those who spend loads of time on their feet, who know exactly where they are going and need a great pair of shoes to help them get there. We have our own manufacturing plant in Cape Town, South Africa, and also import collections from abroad. We distribute our products through our own retail outlets as well as through selected wholesale partners. View our range of shoes: ladies, mens, corporate, kids or use our easily to use search application to find a shoe.